We firmly oppose the badger cull, believing it is both unnecessary, unethical and scientifically flawed. 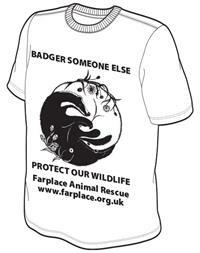 Our BADGER SOMEONE ELSE campaign encourages people to spread the word on the unnecessary nature of this killing. We are similarly opposed to the GREY SQUIRREL CULL carried out by some Wildlife Trusts, also on the basis of bad science and myths blaming greys incorrectly for the problems the reds have had.